“Hamaare Bacche, Hamara School” | DEVELOPMENT LINKS (OPC) PVT. LTD.
CNI-SBSS (Church of North India – Synodical Board of Social Services) with the conceptual support of Development Links (Development Links (OPC) Pvt. Ltd.) will launch a campaign on 5th of September 2018 (Teacher’s Day) to further strengthen the government’s vision to increase parent’s involvement in improving performance of government schools. This campaign will take messages related to school management committees and parent’s role in development of schools to more than fifty thousand people across six states (West Bengal, Odisha, Jharkhad, Maharasthra, Punjab and Delhi) of India. Twelve DBSS (Diocesan Board of Social Services) across six states will partner with CNI-SBSS for implementation of this campaign. It is expected that around ten thousand children going to schools in these areas will be impacted by this process. 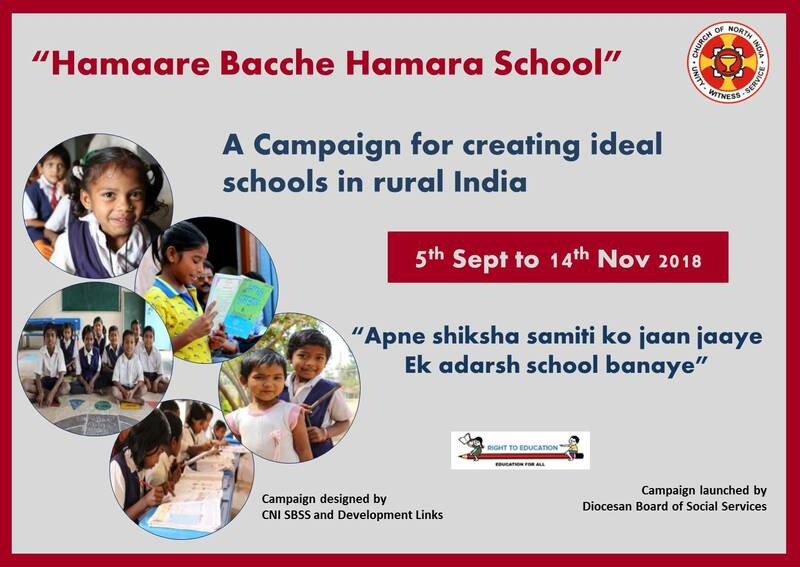 The “Hamaare Bacche, Hamara School” campaign appreciates the work being done by school authorities, education departments in including parents and work being done by existing school management committees in relation to their respective school. Campaign will initiate with appreciating and sharing this work with larger community in respective habitations. Campaign will then help teachers, parents as well as school management committees to further explore their role in improving performance of schools in their area. When Indian Parliament made education a fundamental right of Indian citizen, it was very much aware of critical role of parents in education of their child as well as in performance of institution for delivering the same, i.e. schools. Accordingly, Section 21 of the Act mandated the formation of school management committee with three fourth representation of the parents. A lot of work is done by school authorities as well education department and ministry in different states as well as central to strengthen these school management committees and include parents in improving performance of schools. However, somewhere, due to the vastness of our country, many of the children being first generation school goers and also because of complex social fabric, lot is still to be done to realise the vision of parents becoming fully involved in school’s management/performance issues in many parts of the country. The campaign is conceptualized and designed by CNI SBSS and Development Links (OPC) Pvt. Ltd.